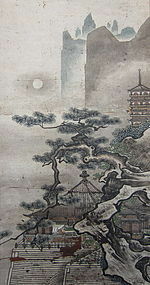 Splendid and majestic Japanese landscape painting showing a pavillion with a large scholar's rock and pine tree. Scroll contains a signature attributing to Sesshu Toyo but may have been added later. Age: Momoyama Period. Size: Scroll: Height: 74.25" Width: 18.3" (with roller ends): 20.5"